Personal robotics is a new technology that is developing very fast in the last few years. Some companies and research groups all around the word are creating continuously new and more capable personal robots. Nowadays only some of these robots are commercially available, but it is expected that this market will grow very fast in future. UC3M Robotics Lab is pioneer research group in personal robotics. Current research is focused in the development of the personal robot Maggie. Vigilance. The robot can act as a guard; detecting intruders, fires, water leakages, etc. Telepresence and teleoperation. The owner can remotely teleoperate the robot, by internet or the cellular phone, to watch and actuate at a different place from where he is placed. This capability could allow the user to pick up something from another room, or watch the home and remotely control electronic devices while being out. Mobile and personal electronic devices. In the last few years there is a tendency to integrate electronic devices such as PCs, imaging devices; videogame systems, communication systems, etc. A new step should be to make them mobile and personal, adding some of those functions to a personal robot. Education. This function is of interest for any person but can be extremely useful when the user of the personal robot is a child. 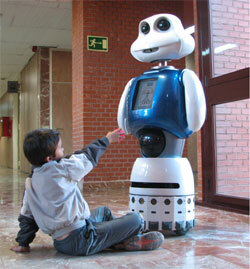 The robot can also incorporate functions of tele-education or documentation (e.g. mobile talking encyclopaedia). Information. The robot, using web services, can inform us about the weather, news, sport results, stocks exchanges, TV programs, etc. Pet. The robot can be fully autonomous and have its own personality that will adapt to the owner, acting as an artificial pet. Productivity functions. The robot can help the owner to organize his activities, scheduling his meetings, reminding his to-do lists, waking him up in the morning, etc. Entertainment. A personal robot can be a playmate. Playing with a robot can not only involve visual interaction, as most video games, but also motion and a physical interaction.